Found this great article on Autoblog wanted to share this with the industry! Lincoln has finally given its SUV a facelift after seven long years. Seven years is a long time. For the auto industry, though, seven years is an absolute eternity. Most vehicles receive clean-sheet redesigns within the span of seven years, usually getting a facelift of some sort after year three or four. Not Lincoln. Nope, believe it or not, Lincoln has sold the same vehicle since 2007, adding little more than small mechanical tweaks or new paint options. Yes, we’re talking about the Navigator, a full-size sport utility vehicle that hasn’t felt fresh and competitive for a while. That’s now changed, as Lincoln has finally given its SUV a facelift for model year 2015. It hasn’t changed dramatically, though. This is still a big, luxury-oriented SUV. It’s a body-on-frame vehicle, designed to tow and relax in equal measure. After seeing it in person at a closed backgrounder ahead of its Chicago Auto Show debut, we’re left wondering if maybe Lincoln still has any business playing in the realm of the Mercedes-Benz GL, Cadillac Escalade and Range Rover. You can make up your own mind on that front. But while you’re doing that, have a look below at just what Lincoln has done to freshen the 2015 Navigator. Gone is the 5.4-liter Triton V8 of the old model. In its place sits the familiar 3.5-liter, EcoBoost V6.The big news for the Navigator comes under the hood. Gone is the 5.4-liter Triton V8 of the old model. In its place sits the familiar 3.5-liter EcoBoost V6. Lincoln is touting at least 370 horsepower and 430 pound-feet of torque, making this the most powerful version of the twin-turbo EcoBoost six-cylinder we’ve seen. For comparison, the current Ford F-150 EcoBoost is quoted at 365 hp and 420 lb-ft, while the new Escalade’s 6.2-liter V8 promises 420 hp and 460 lb-ft of torque. Lincoln projects that the new engine will deliver best-in-class towing of 9,000 pounds, besting the more powerful Escalade’s 8,200-lb tow rating. The new engine will also be exclusively mated to a six-speed automatic that will feature a manual mode, and both rear and four-wheel drive will be available. While no specifics are available yet, Lincoln is projecting a big bump in fuel economy over the outgoing powertrain. To iron out the ride of the body-on-frame SUV, Lincoln has fitted its Drive Control system, which uses continuously controlled dampers to monitor road conditions and adjust the ride accordingly. Like in the MKZ, the Navigator will feature Sport (ha! ), Comfort and Normal modes for its adaptive dampers. As the Navigator had been rolling about with technology from 2007, one of the priorities for the new model was to update the quality and caliber of the vehicle’s systems. MyLincoln Touch with Sync is now standard and controlled through an eight-inch, touchscreen display in the dash. The instrument cluster, meanwhile, is now home to twin 4.2-inch displays that flank a central speedometer, much like the rest of the Lincoln range. Push-button start is standard, as is passive entry. A rear-view camera comes standard, although blind-spot monitoring will be an optional extra. The old Navigator’s dated, bling-bling front fascia has been completely replaced with something that looks vaguely like Lincoln’s so-called “split-wing grille.” The new design strikes us as a heavy handed and uninspired, lacking the sort of style we so enjoyed on the MKZ. As for the rear end, we’ll simply mention that there’s more than a little of cross-town rival Dodge Durango to be found in that light cluster. Functional changes for the Navigator’s exterior include HID headlamps with LED running lights, as well as full LED taillights. Twenty-inch wheels now come standard, up from 18s on the 2014 model, while a set of striking 22-inch wheels is available as part of the “Reserve” package. The two Navigators we saw both featured the 22s, and we’ll admit, they were one of the highlights of this refresh. 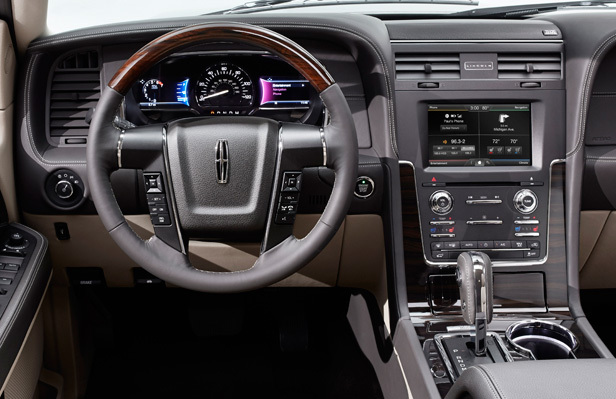 Below the eight-inch touchscreen is Ziricote wood, which Lincoln claims is the first time the wood, which is traditionally found as an accent on yachts, has been used in a vehicle. But surrounding the touchscreen is cheap, hard, off-black plastic, above which is leather. It’s a similar story on the doors, where padded leather makes up the arm rest and wood acts as an accent, while the rest of the door is plastic. The steering wheel, meanwhile, features Wollsdorf leather and wood accents, but is sourced from the current Ford F-150. The blend of high-quality materials with cheap plastic taints what could have been a solid interior update. We can slam the Navigator for its interior materials all day long, but what isn’t in dispute is the absolute wealth of room it provides. These are still huge vehicles, with the short-wheelbase offering up 54.4 cubic feet of space behind the second row. Fold the second and third rows down, and the volume increases to 103.3 cu. ft. The Navigator L, meanwhile, has 86.3 cu. ft. of space behind the second row. Fold both rows down, and LWB models offer 128.2 cu. ft. of space. That’s very nearly as much as a long-wheelbase Transit Connect, and it handily bests the 120.5 cu. ft. of the new Escalade ESV. 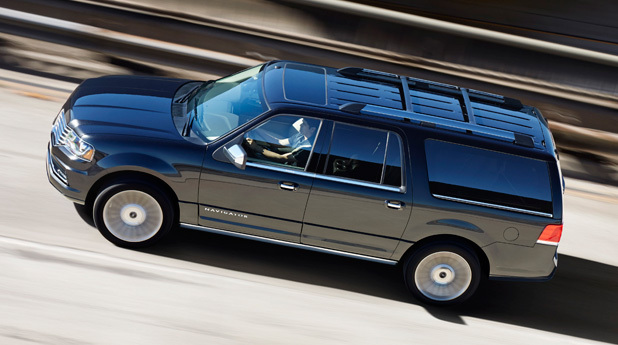 The 2015 Navigator is expected to begin production at the end of the summer, with sales slated to begin in early fall. We’ll have more on the Navigator when it makes its official debut at the 2014 Chicago Auto Show early next month.